I was confused. I was 10 years old. Why did Cassius Clay change his name to Muhammad Ali? Why wasn’t he a Christian anymore? And what is this Muslim religion he now followed? Why would anyone walk away from Christianity? Why were so many people mad at him? There was a lot more to Muhammad Ali than a “jab.” The May 5, 1969 issue of Sports Illustrated reported that Ali’s jab could smash a balsa board 16.5 inches away in 19/100 of a second. It actually covered the distance in 4/100 of a second. Ali was the fastest heavyweight ever. Those lightening fast hands and a pair of legs that moved around the ring like Fred Astaire made him a three-time heavyweight champion of the world. He made a total of 19 successful title defenses. Ali was a force in the ring and a force outside of it. It was outside of the ring that Ali stirred up so much controversy. Before he was a Muslim, Ali was a Christian, of the Baptist variety. But he dropped Christianity and picked up Islam. Being the son of a Baptist pastor and living in a world that revolved around Christianity and the church, this really bothered me. Ali, when he was Clay, was a Baptist. I was a Baptist (at the time). Rather than looking down at Ali, as was done, maybe we should be looking hard at ourselves. Look hard at the racism in the southern Christian churches. The prevailing orthodoxy was that non-whites were inferior spiritually, morally, and mentally. Racism remained longest where Christian belief was the strongest. 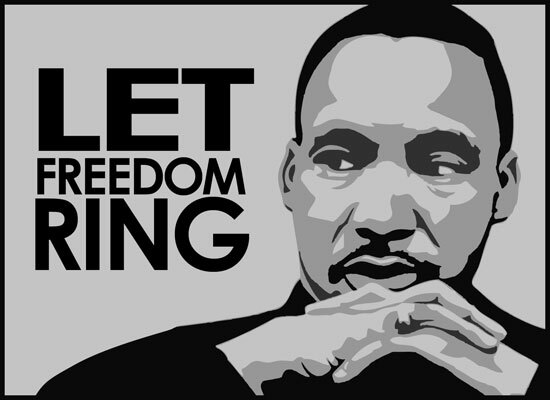 It was not bishops or preachers but freethinkers, secularists, and atheists intellectuals who spread the idea that all should be treated equally. I wonder if the story of Cassius Clay would have been different had Christians lived more like Jesus Christ. I wonder if I’m pushing anyone away from Christianity because I’m not living like Jesus. I’ve heard it called the United States of Amnesia. We must not forget how our past, present and future are woven together. Let’s remember the culture in which he lived. Let’s repent of any attitudes and actions that don’t reflect Jesus. Let’s use our memories of the past to motivate us to create a better present and future. We know about “an apple a day” keeping the doctor away, but how about a “hug a day” keeping anger, bitterness, prejudices away? With tears running down his cheeks, a “Free Hugs” sign hanging around his neck, Devonte stood in front of a police barricade. 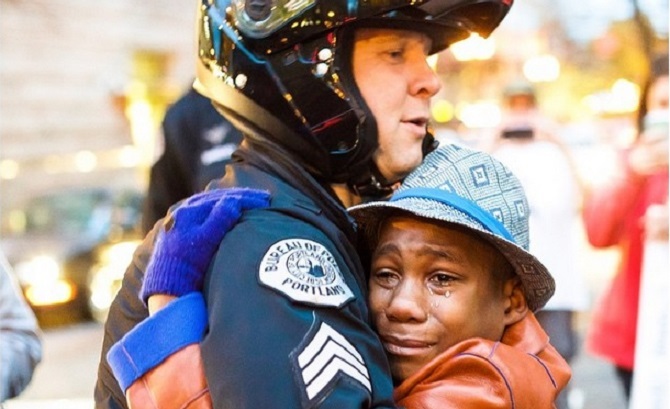 Officer Barnum noticed the boy and wondered what was wrong. He motioned the young protestor to come up to his motorcycle. They talked. About school. About summer activities. About favorite things to do. Then there was this question from the Officer, “Why are you crying? Devonte’s answer was an honest response about his fears regarding the level of police brutality towards young black kids. The officer wasn’t defensive. He didn’t react. He didn’t give the boy a lecture. The picture is the answer to the question. Are there other answers in the action? Yesterday, I completed a series on “The Bible You’ve Never Known” with a teaching on taking a different look at what the Bible says about homosexuality. One take away from the message was Jennifer’s message: Listen to each other. Hear peoples’ stories. Seek to understand. Sympathize and empathize. “Walk a mile in my shoes. Walk a mile in my shoes. What difference would it make in our lives, our communities, if we “walked in other’s shoes,” if we looked with compassion? 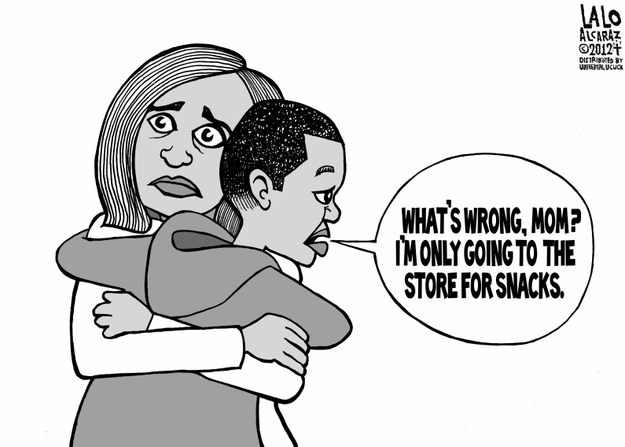 Is the answer to the ills of Ferguson as simple as a hug? As listening? As being compassionate? I don’t know. But I think I’ll try it. The color of God’s skin and Santa’s skin came up this week on “The Kelly File” with Megyn Kelly. Ms Kelly says that both Santa and Jesus are white. Ms Kelly was responding to an article by Aisha Harris in “Slate” in which Ms Harris writes a personal account of her childhood feelings of exclusion brought on by the culturally created white Santa. Ms Harris suggests a more inclusive Santa – a Penguin. Ms Kelly and the panel didn’t think much of the idea. You can see their discussion here. Personally, I don’t have any trouble grasping a Penguin Claus. Once you give a guy magical elves and the power to squeeze his roly-poly body down billions of chimneys in one night, anything is possible. Yes, our view of Santa comes courtesy of Coca Cola and Clement Moore, and Santa is white in those depictions. No argument there. But Jesus’ race? Behold the power of pictures. European art throughout the centuries have shown Jesus as a white man. It stuck. Pick up one of those “Bible Story” books in a Sunday School classroom and you’ll see a white Jesus on the pages. The baby Jesus in the manger of our Nativity on the buffet in our dining room is white, blond-haired, blue-eyed and rosy-cheeked. Millions of people watched The History Channel’s The Bible and they saw a light-skinned Jesus. Does it matter? I think so. It matters historically and theologically. Christianity is an historical faith. It is rooted in historically verifiable events. We value that. So, let’s value what history teaches us about Jesus’ race. Jesus was Jewish. Jesus lived in Palestine. In 2001 a team of British anthropologists and forensic scientists created a hypothetical model of Jesus’ face based on the skull of a first century Jew. Guess what. He’s not white. Some people are uncomfortable with that? Wonder why? Let’s be true to history. Theologically, it matters. It’s interesting to me that every culture makes Jesus look like them. African Jesus. Asian Jesus. Touchdown Jesus. Why? I think it has something to do with the incarnation – you know, what Christmas is all about. God becoming one of us. God connecting to, identifying with – becoming us! WOW! These different portrayals of Jesus help us to get our hearts around the theological truth that God knows us, understands us, identifies with us. Because He became us. All of us. So, what color is God’s skin? I’m happy with the answer given in the rest of the song: It is black, brown, yellow, it is red and it is white. Everyone’s the same in the good Lord’s sight.